CAN A LOVE BE LOST THAT WAS MEANT TO BE? A rising star in the modeling world, Margot Radcliffe hasn’t forgotten the hurt that sent her running from Rosewood, the beautiful Virginia horse farm where she was raised. Travis Maher, a ruggedly handsome rebel and gifted horse trainer with a hard-knock past, had once captured Margot’s heart—only to break it. But when tragedy strikes her family, Margot is forced to set aside her skyrocketing career and return to a place she never expected to see again, where the legs that everyone admires belong to Thoroughbreds, not supermodels. 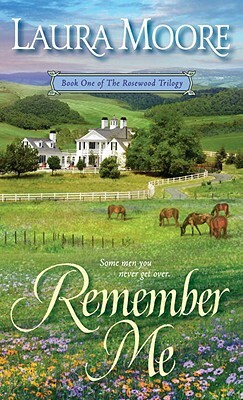 Now Rosewood Farm’s success depends on Margot, and the only person she can count on for help is the very man who so ruthlessly rejected her love all those years ago. As Margot and Travis enter an uneasy truce to save Rosewood from financial ruin, their wild natures clash and their unresolved passions for each other begin to surge. But can this hard-edged horseman find a way to express his desire for the one woman he’s ever loved before she’s lost to him forever? Laura Moore is the author of Believe in Me, In Your Eyes, Night Swimming, Chance Meeting, and Ride a Dark Horse. She currently lives in Rhode Island with her husband, two children, and one very old black Lab. One of her great thrills as a writer is to hear from readers.